We’re once again approaching the stage of the season when the sackings of football managers rises from a trickle to a torrent. According to The Sack Race, 24 managers in the top four divisions have already left their posts since the start of 2015/16 (although I think Hasselbaink makes it 25) and that number will probably rise further before the end of the year. 1. Is the average tenure of a football manager – the amount of time they spend in a job – changing, and if so how? 2. If there has been a decrease, does it have an identifiable starting point? Did the formation of the Premier League bring about a more impatient era, or was it already this way? 3. How does the average tenure of a manager vary across divisions and have all divisions experienced the same trend over time? To answer these questions, I’ve collected 50 seasons’ worth of data on the managers of every club to have featured in the top four English divisions. The next part of the article explains where I got the data from and what I did with it, so if you’d rather skip straight to what I found, then feel free to scroll past it or click here. For each of the top four English divisions, I’ve collected the start and end dates of the tenures of each club’s manager, including any spells when each club was managerless. I’ve accumulated 50 years’ worth of data, starting with the 1965/66 season, which feels like long enough to get a handle on any trends and also to encompass the careers of enough of the game’s legendary long-serving managers. I may end up going back further in a subsequent revision of this article, but for now it feels like enough. However, what I’ve found out pretty quickly is that the data available online is a bit of a mess, particularly the older stuff. When I originally had the idea to do this I thought that sourcing the data would be relatively easy, but once I started looking at it in detail I spotted plenty of errors, gaps and vagueness. I started with the two major public domain sources of manager reigns I knew about: Soccerbase and Wikipedia. Soccerbase lists each club’s managers with their joining and leaving dates (like this for example), while Wikipedia’s information varies from club to club: some of the bigger ones have a separate page listing every manager’s record, but for others it can be a bit sketchier. Once I started combing through both of these sources I found that neither is perfect nor consistent. Even for larger clubs, the start and end dates of a manager’s reign become less precise: you’ll often get data like “August 1972” for example. For small (or extinct) clubs whose membership of the Football League was relatively fleeting, there are significant gaps to hunt down and close, in addition to the general vagueness. I’ve made my dataset – combined from the various sources I’ve found – available on a Google Sheet here. You’ll see that I’ve flagged stuff that I’m not sure about, which is mainly where I’ve had to record dates as the first of the month due to not knowing the specific day a manager joined or left. If you have more accurate information or know of any useful links where I can find it, then please let me know. I’ve enabled comments on the sheet for people to annotate any information, but you can also email me or tweet me. My hope is that I’ll get enough improvements to the data to warrant re-publishing this article with more accurate information later in the season, but either way I’ll keep this sheet available for anyone who wants to reference it. Who counts as a manager? As I started collecting the data I quickly discovered that there were a couple of “rules” that I needed to establish before I did any analysis. First of all I need a consistent rule for handling “caretaker managers”, as there are plenty of mid-season departures where at least one competitive match was overseen by a caretaker while a successor was sought and appointed (a recent example is Kevin MacDonald taking charge of Aston Villa in between Tim Sherwood’s sacking and Rémi Garde’s arrival). I don’t want to count managers who are clearly short-term stopgaps between permanent appointments, so I’ve decided not to include caretakers unless they were in the job for an unusually long spell (I’ve indicated in the data where I’ve done this). A more practical (i.e. selfish) reason not to include every caretaker manager is the amount of extra work required to collect and validate information which doesn’t add a proportionate amount of value. Given that the average caretaker’s spell in charge is quite short, even if I meticulously added them all in it wouldn’t have much of an effect the overall average. What counts as a season? Because I’m looking at multiple divisions, I also need a way to handle promotion and relegation e.g. if a manager gets his club promoted from Division 3 to Division 2, at what point does he switch from being a Division 3 manager to a Division 2 manager? I’ve therefore decided to define each season as beginning on 1st July and ending on 30th June, so you’ll sometimes see big jumps in the average on these dates when a long-serving manager gets his team either promoted or relegated. Straight away we can see that while there is a big difference between how long the average top flight manager lasts today compared with 50 years ago, it can’t all be blamed on the Premier League. 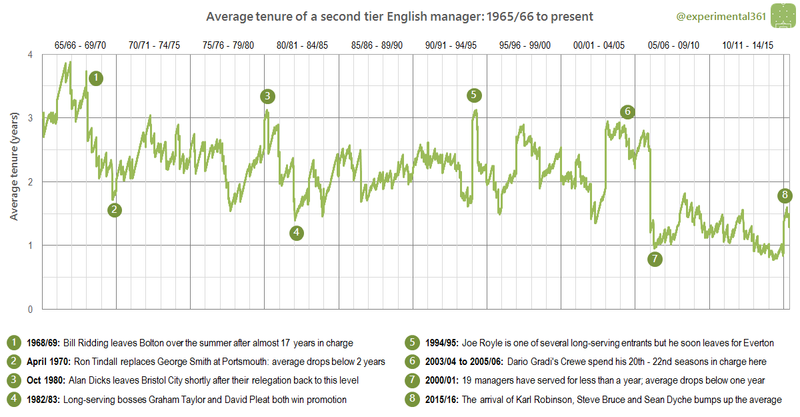 After rising above seven years in 1973 (point 1 on the graph), having rarely dropped below five, the average tenure plummeted thanks to several legendary long-serving bosses all leaving their posts at a similar time (point 2). Despite another long spell of stability in the late 1970s (the almost-straight diagonal section of the line between 3 and 4 on the graph), the average seldom rises above four years thereafter. At the end of this spell was the last time that every top flight club had a manager who had been in the job for at least a year. 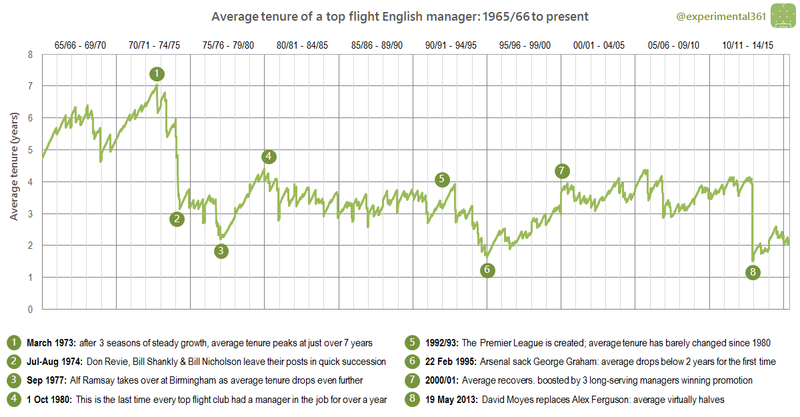 From 1980 onwards the average time a manager spent at a top flight club bounced between three and four years until shortly after the Premier League was established in 1992 (point 5 on the graph). While its introduction was followed by a sharp drop in manager tenure during the following three seasons (between points 5 and 6), it had recovered to roughly the same level it had been ever since 1980 after a further five years (point 7) and stayed that way until Alex Ferguson’s retirement. However the huge drop when Ferguson left United and another long-serving manager – David Moyes at Everton – replaced him (at point 8) shows just how much the average was down to a few exceptional survivors. Ferguson had been in charge for over 26 years and Moyes over 11. It’s pretty clear that the graph gets less green as you move from left to right: at the start of the 1980s around half of the division’s clubs had been managed by the same man for at least three years, but since the mid 1990s this has been a rare occurrence. The last time this was fleetingly true was in May 2004, when Kevin Keegan celebrated three years at Manchester City just as Rafael Benitez was being replaced Gerard Houllier at Liverpool, which immediately took us back down from ten to nine. About a third of the way along you can see where the orange section cuts the red section in two: that’s point 4 from the first graph when every club in the division last had a manager who had been in charge for at least a year. We can now use the same two graphs to look at the other three divisions and see how they compare. While we only had relegation to contend with in the top flight, here we have the effects of both promotion and relegation. Long-serving managers can join and leave the division from two directions, although obviously getting promoted from the third tier is much more common. An exception is point 5 on the graph above, where Oldham stick with Joe Royle despite their relegation only for him to leave for Everton partway through the season. If you ignore the three-season spike caused by Dario Gradi taking Crewe to this level (point 6) then there looks to have been a steady decline in the average tenure from the late 1990s until the end of last season. Given that the average had been happily bouncing between two and three years for much of the preceding 30 years, it looks much more likely to be caused by the introduction of the Premier League. There have definitely been a lot fewer long-serving managers around in the last ten years. When Steve Cotterill left Burnley in November 2007 he was the only manager in the division with more than three years’ service and, while the numbers recovered slightly, for most of the last two seasons there hasn’t been a single manager at a club for this length of time. Cotterill’s departure came shortly after point 7 on the first graph, when 19 of the division’s 24 managers had been in charge for a year or less and the average dropped below one year. This is the deep red trough below the “05/06” label in the graph above. Again we have a peak relatively early on, ended by the departure of a long-serving manager (point 1) and the average never recovers. Between two large drops (at points 2 and 3) it looks like the average tenure was actually increasing – it even recovered after point 3 until another drop after the 1996/97 season looks to have sent it onto a downward course. As for the second tier, I can just about convince myself that the average has been slowly decreasing since the 1990s. While the promotion and relegation of long-serving managers in points 4 and 5 make the line quite “noisy”, the average has gone from being mainly above two years in the 1990s to mostly below 1.5 years in recent seasons. This could be a knock-on effect from the instability of the Championship where more League 1 managers are recruited to fill the increasing number of vacancies. There does look to be a gradual decrease in green as we go from left to right here. Towards the far right we can see the orange spike corresponding with point 6 in the previous graph, where 20 of the division’s 24 managers had been in their jobs for at least a year. While this was the first time since 1993 that so many managers had lasted a year, it looks to have been a short-lived phenomenon, with this number reducing to 12 by the end of the season. The vertical scale has been compressed further here, as at no point in the last 50 years has the average tenure for the fourth tier risen as high as three years. Once again we have a peak early on (point 1) as for all of the other divisions, although this is the only one to be followed by a trough comparable to the lowest average in the 50-year sample. After Bradford Park Avenue’s Jack Rowley departed in July 1968 (point 2) there wasn’t a single manager who had been in a job for over two years. For much of the last 50 seasons the average manager tenure has bounced between one and two years – seldom breaching this range or staying outside it for long – and is actually slightly on the high side at present. Between points 4 and 6 – again shortly after the formation of the Premier League – there was a period of relative instability, but the last ten seasons have seen a relatively calm existence. Apart from the far bottom left corner, there doesn’t seem to be noticeably less green on the right side than the left, suggesting that the lifespan of a fourth tier manager hasn’t really changed much in 50 years apart from that blip in the early 1990s. You can make out points 5 and 6 on the first graph as the two occasions where the red section touches the 4 club gridline, but for most of the time it stays above the 8 club line. Promotion and relegation add a lot of noise to these charts, so as a final exercise I wanted to add all of the divisions together to see what that looked like. The line is definitely a lot smoother without all the promotions and relegations. The second, third and fourth tiers all had an early peak in the late 1960s and these all superimpose nicely here, followed by the top flight’s slightly later peak in the early 1970s which is diluted from seven years to around half that value. From the early 1980s to the mid 1990s the average tenure looks to have been pretty stable between 2 and 2.5 years, before dropping sharply by over a year in 1994/95. After that it recovered before seeming to stabilise at around 2 years but the dual departure of Alex Ferguson and David Moyes at the end of the 2012/13 season saw it plummet to below 1.5 years. We can see that at the start of the 50 years on the left, the two green categories, which represent every manager in a job for two years or more, regularly hits the 50% mark i.e. half of the 92 clubs had a manager who has been around for at least two years. Move over to the modern day on the right and the two green areas are hovering at around the 25% mark, meaning that nowadays only a quarter of clubs in the top four English divisions tend to have a manager who’s been around for two years or more. The biggest drop has been in the dark green “over three years” category. At the time the Premier League was founded just under a quarter of the managers in the top four divisions had been in their jobs for at least three years and this had been the case for about 20 years. However during the last ten seasons this number has fallen currently stands at just 12 clubs: just over an eighth. Similarly the red “under 1 year” category looks to have increased in size over time: it rarely reached down as far as the halfway mark before the 1990s, but it’s regularly breached the 46-club line since then. The average manager in the top four English divisions spent between three and four years in a job 50 years ago – over five years if you just count the top flight – but this has dropped to fewer than two years today. The average manager lasts a lot longer in the top flight than in the divisions below, but this is to be expected given that managers in the lower divisions can be poached or get promoted, as we’ve seen many times in the data. There are definitely fewer longer-serving managers around than there used to be, even since the mid 1990s. It’s unclear whether the inception of the Premier League caused this, but many of these trends seem to have started within a few years of its founding. Managers endured a precarious existence long before the Premier League came along: for example, the last time every English top flight club had a manager who had been in the job for at least a year was in October 1980. There’s a lot more that can be done with this data which I’ll save for a later date – this post is far too long as it is – but if anyone has any questions or suggestions then please let me know via email or Twitter.